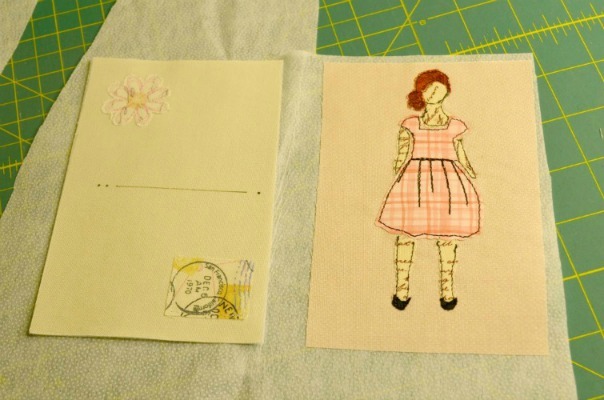 As I described in a previous post, this is the week that Stitched Postcards will be traveling through the postal systems of over 20 countries in the Great Big Stitched Postcard Swap. 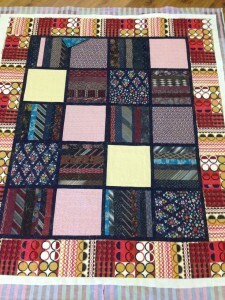 I received my swap partner: Chrissy, in Aylestone, Leicester, England. 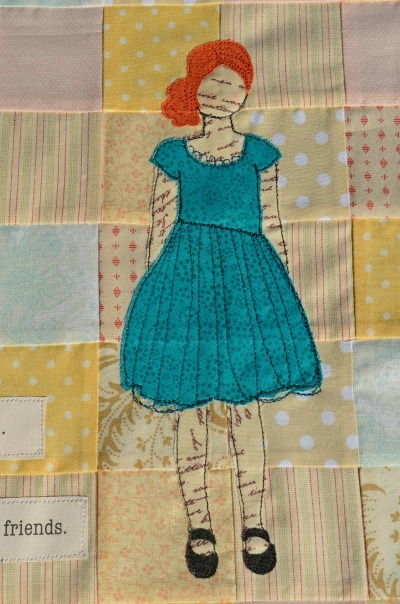 It will be great fun to anticipate what will be arriving in my mailbox from her. 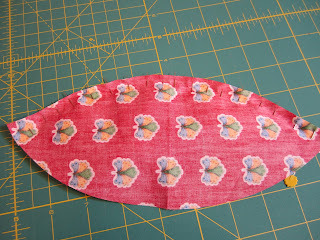 I chose a tiny white dot on a pink background as my background fabric. 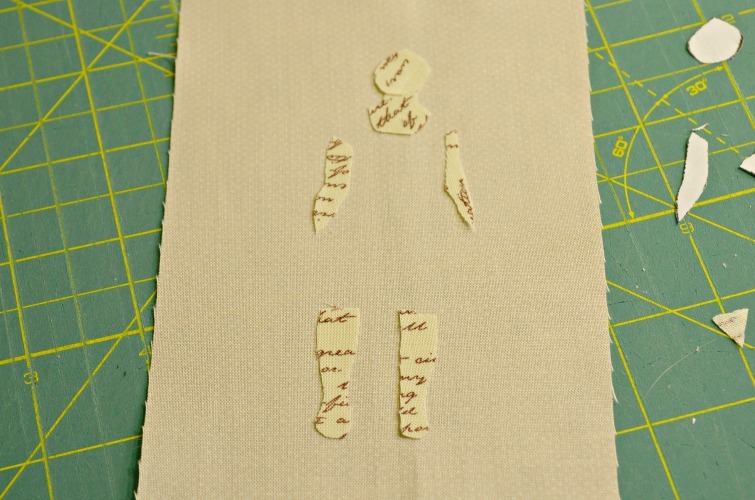 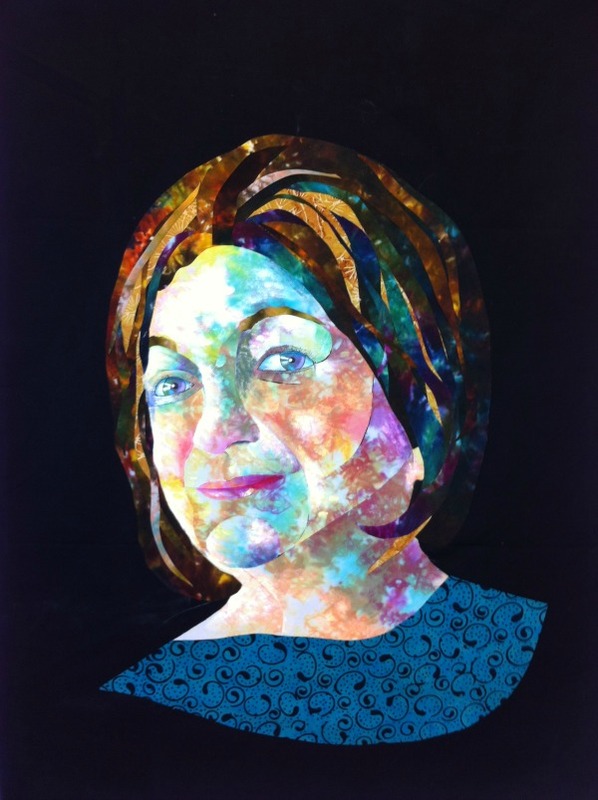 The skin areas were cut from a text fabric and placed on the background fabric. 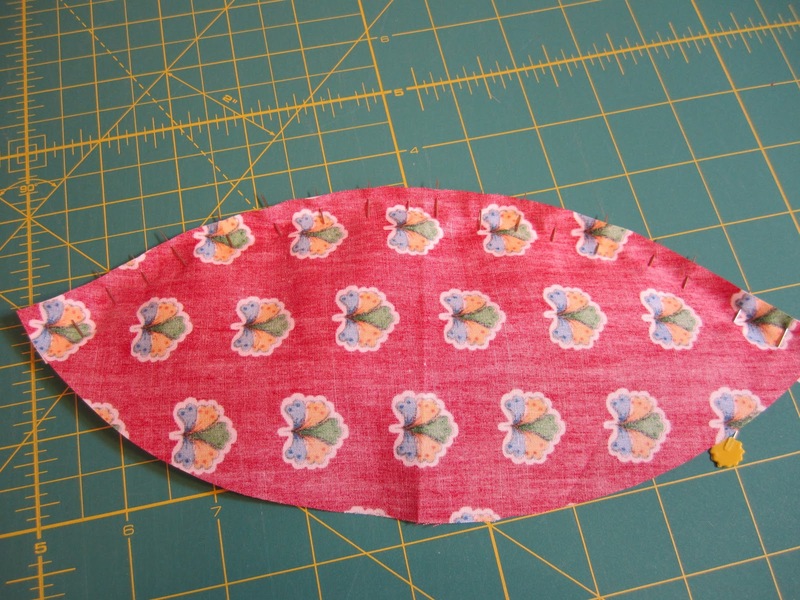 These are really tiny pieces of fabric! 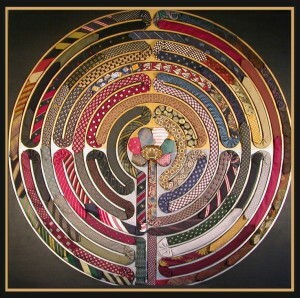 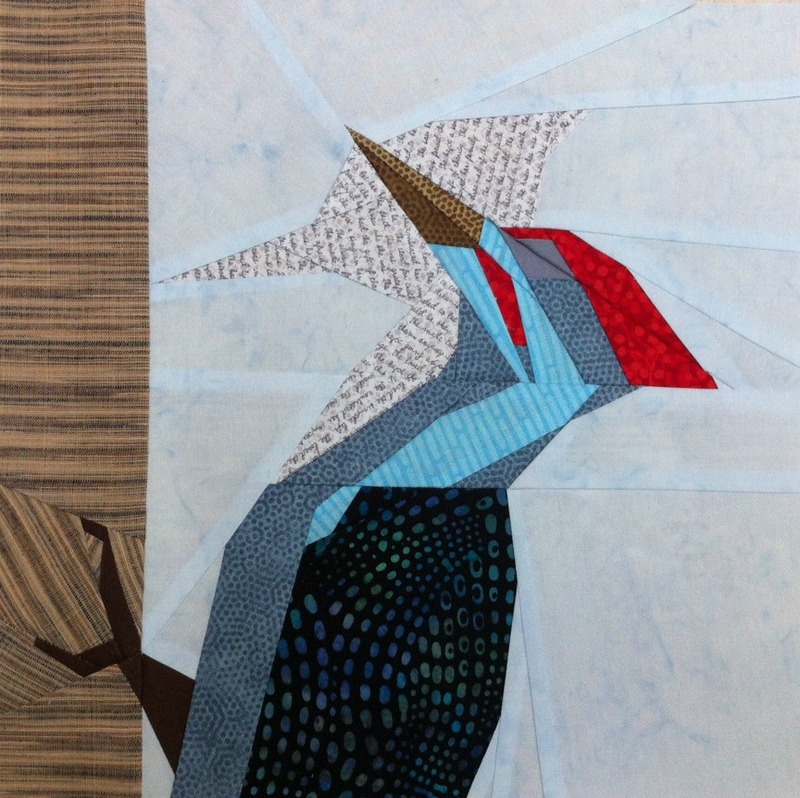 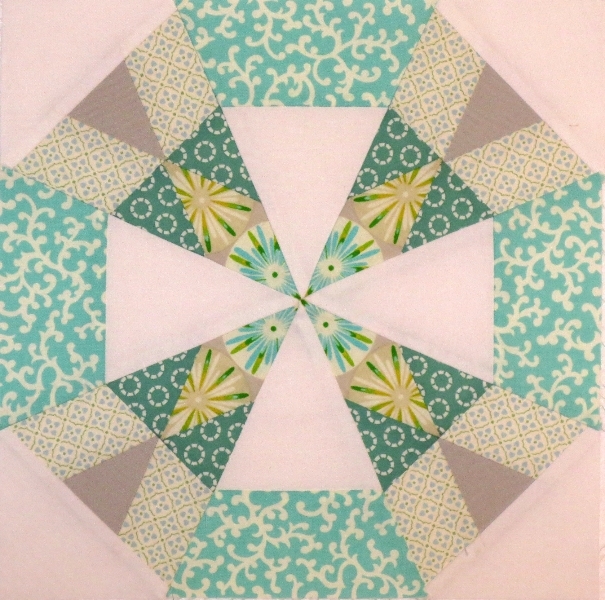 One of the challenges of this swap was to incorporate paper into the design. 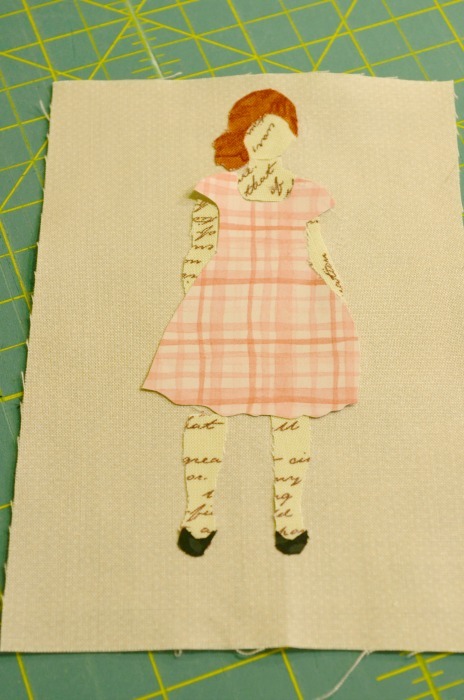 I used a piece of scrapbooking paper to make the girl’s dress. 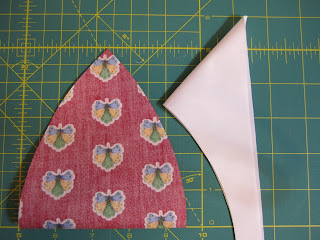 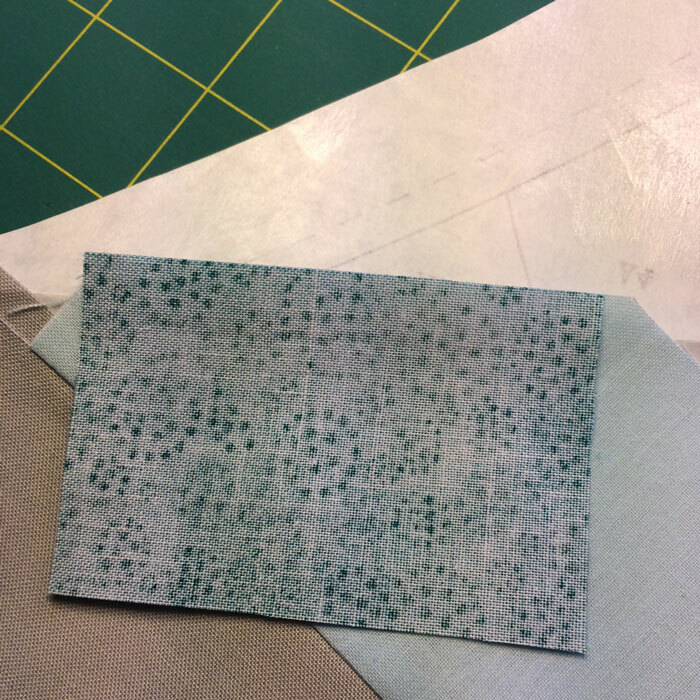 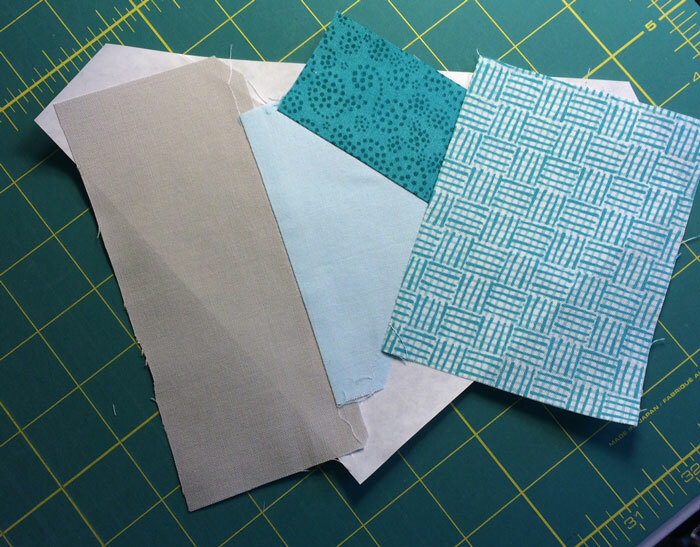 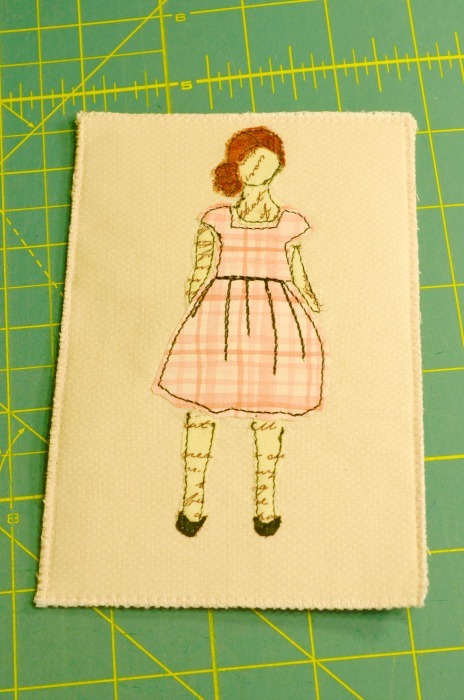 I then used tiny pieces of fusible interfacing to fuse the pieces to the background fabric. 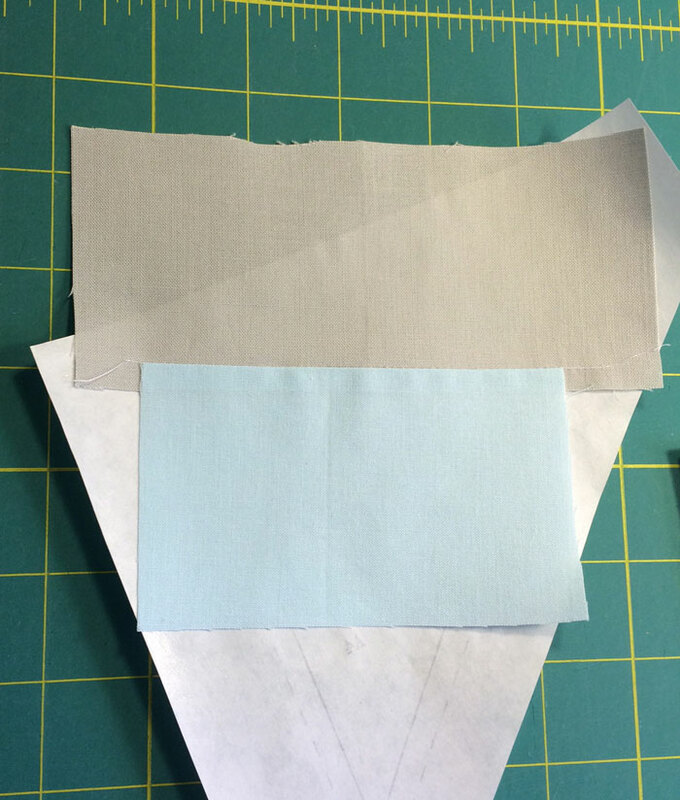 Did you know that paper can be fused this way, too? 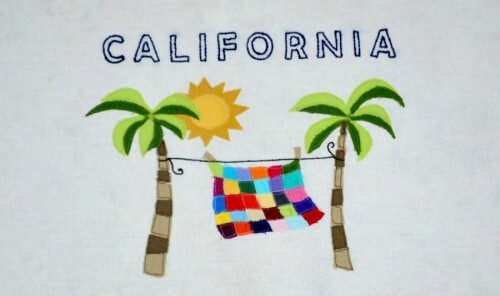 Neither did I, until now. 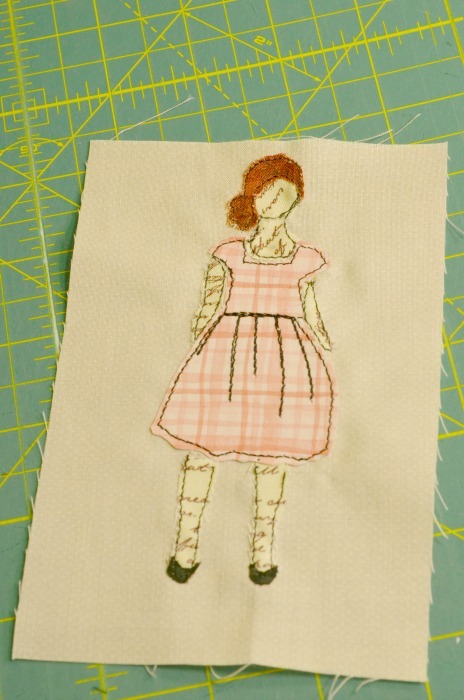 Then I put her into the sewing machine and did some free-motion outlining with black thread to give the design some detail. 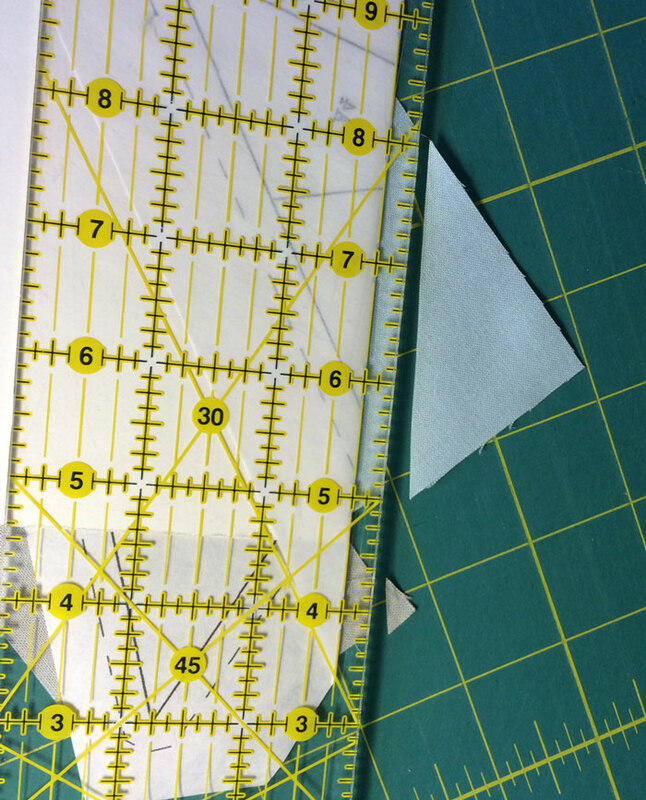 Then it was time to work on the back of the card. 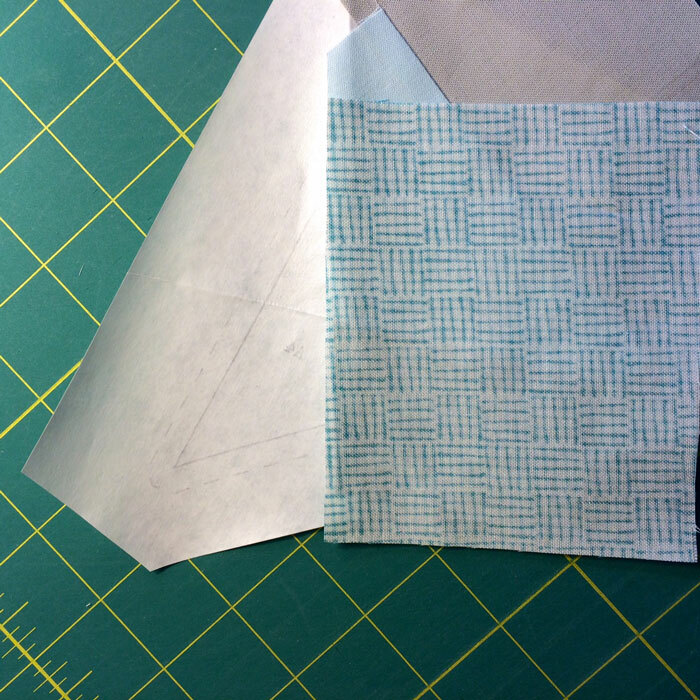 I used white cotton fabric and drew the dividing line with a black Sharpie. 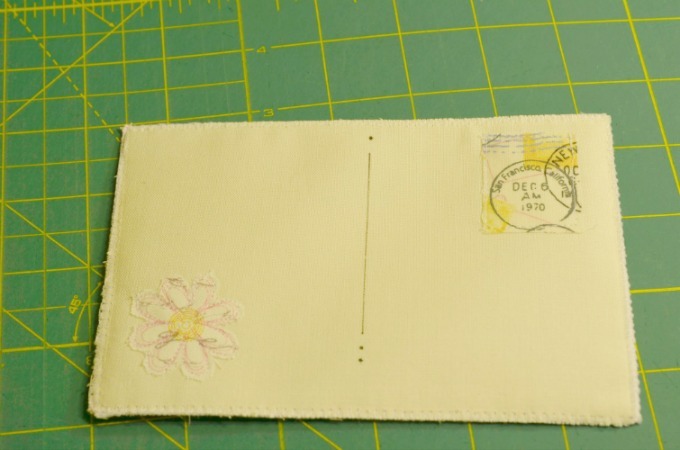 I appliqued a flower in the lower left corner of the card, and used a post-mark motif to make a faux stamp for the card for a little whimsy. 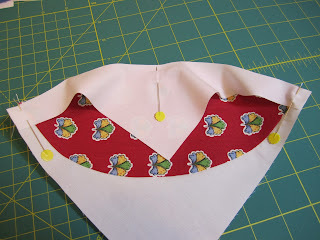 I am going to enclose this in an envelope to mail it to Chrissy, so I don’t need to leave space for a real postage stamp. 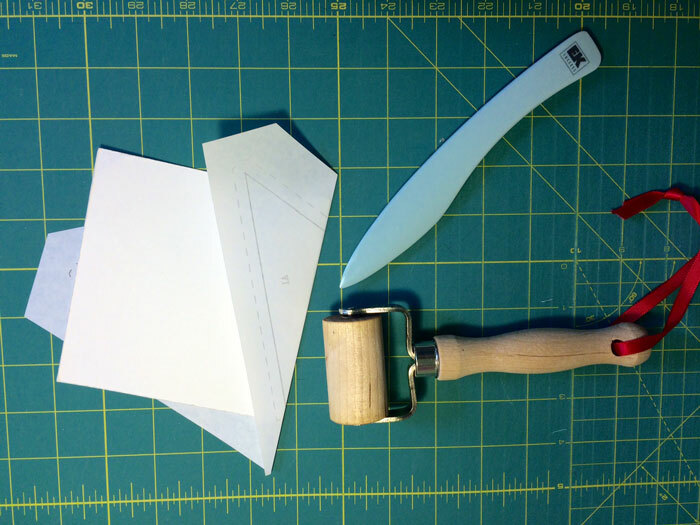 The next step is to provide some stability for the card. 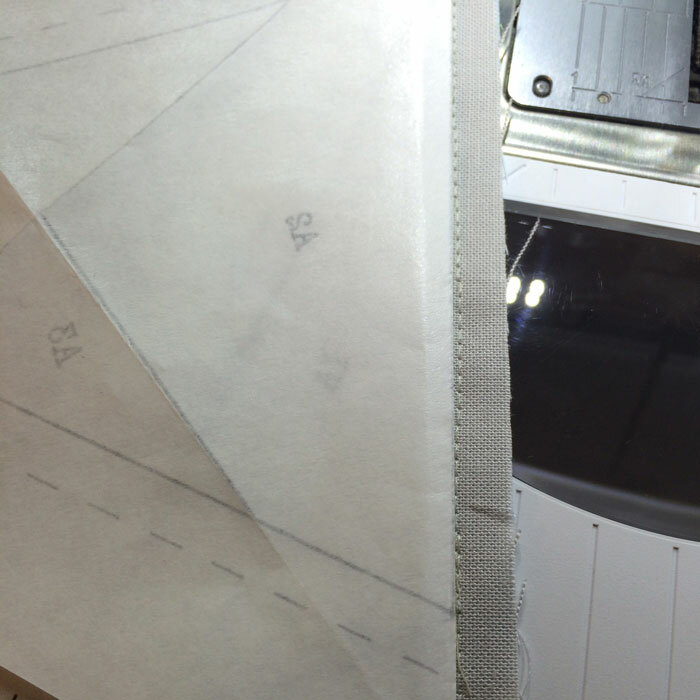 I ironed each piece on to a heavy weight fusible interfacing. 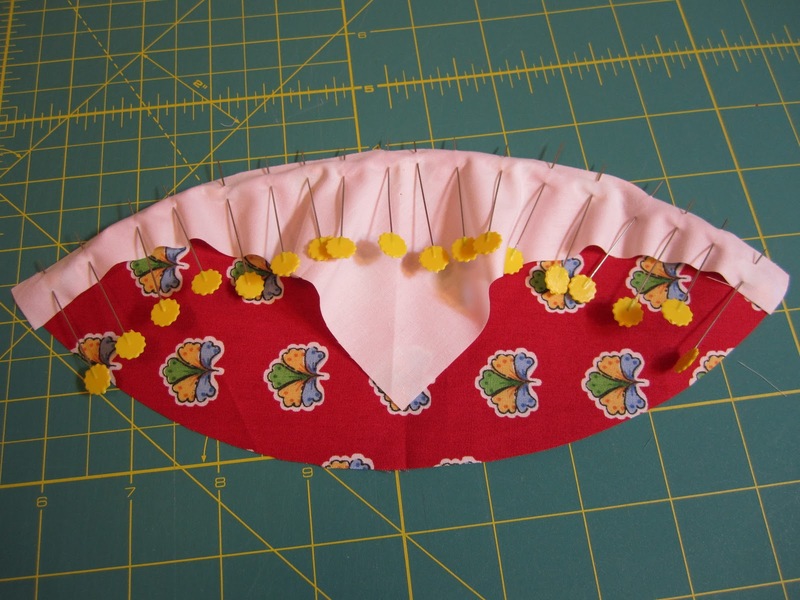 This will give the card some stiffness, but won’t make it rigid. 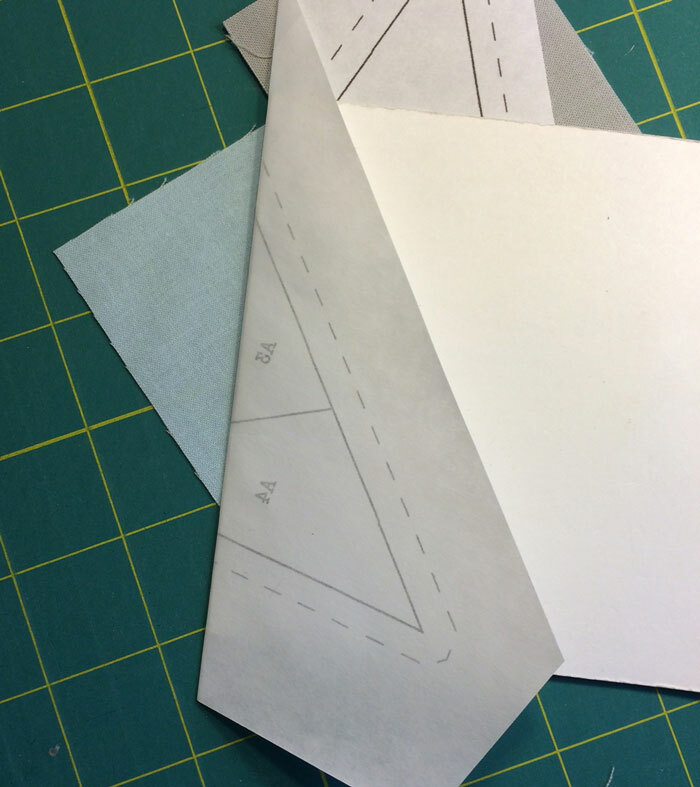 I then cut out the front and back pieces, placed them with their interfaced sides together, and used a zig-zag overlap stitch around the perimeter of the card to hold the two pieces together. 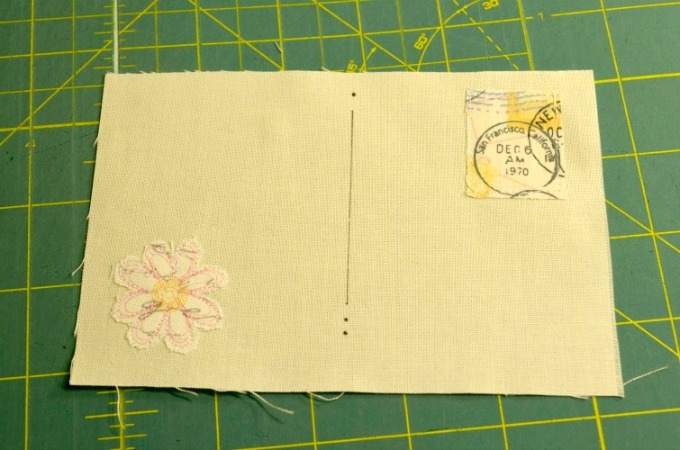 The back of the card is now ready for my note to Chrissy, and to be popped into the mail and sent on its way to England. 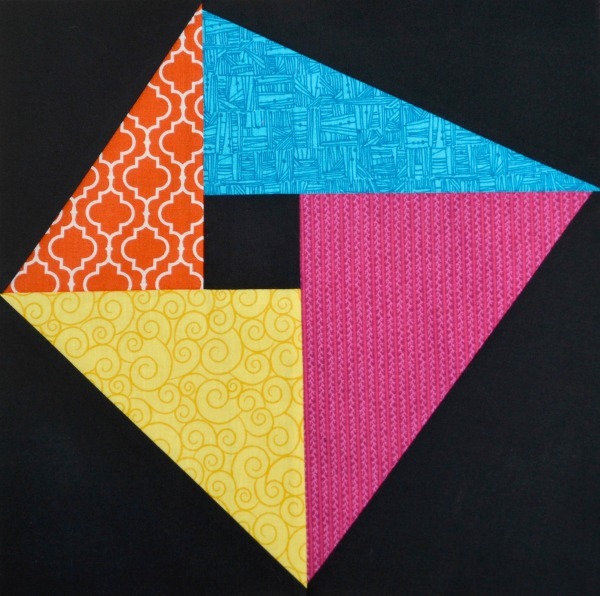 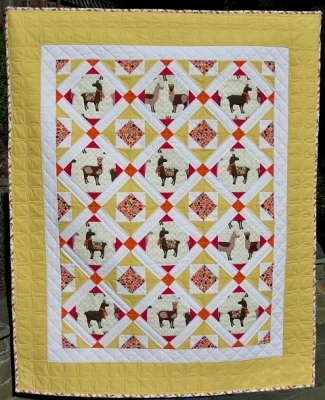 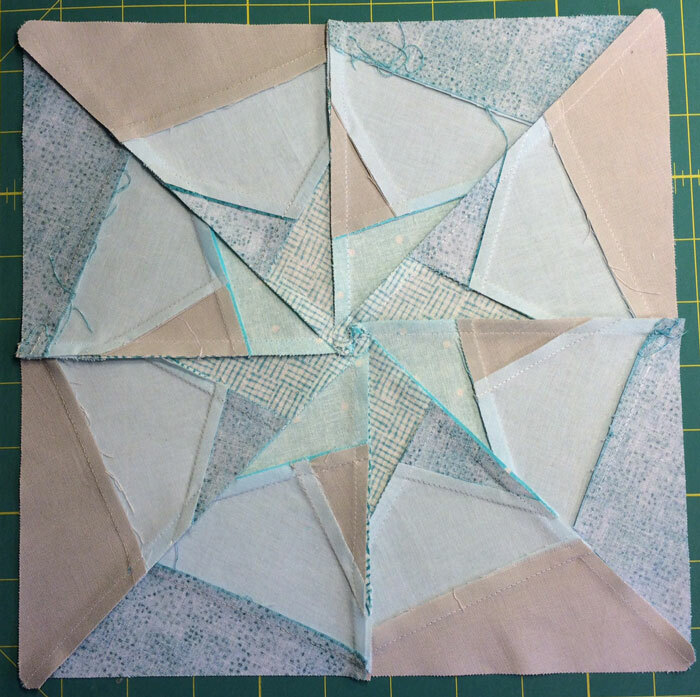 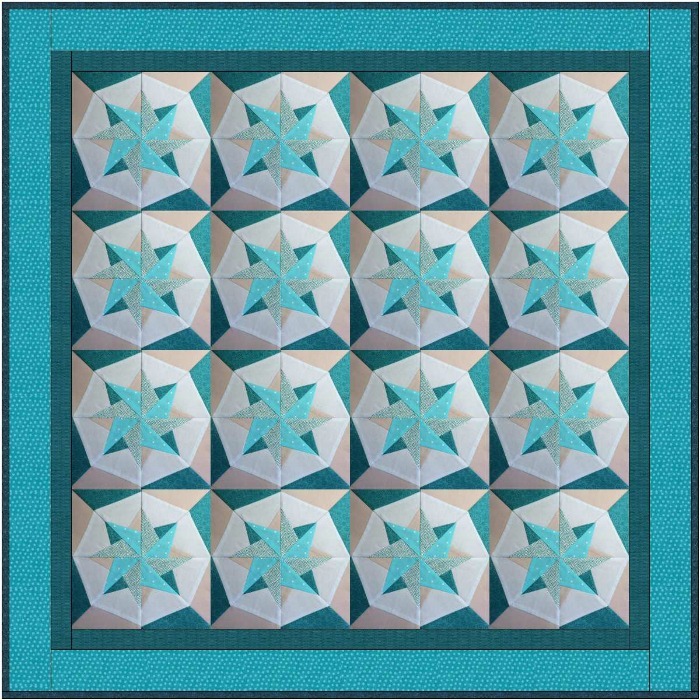 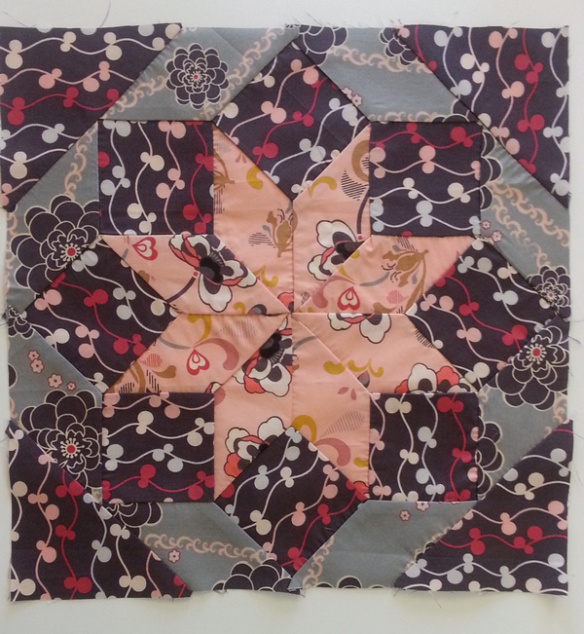 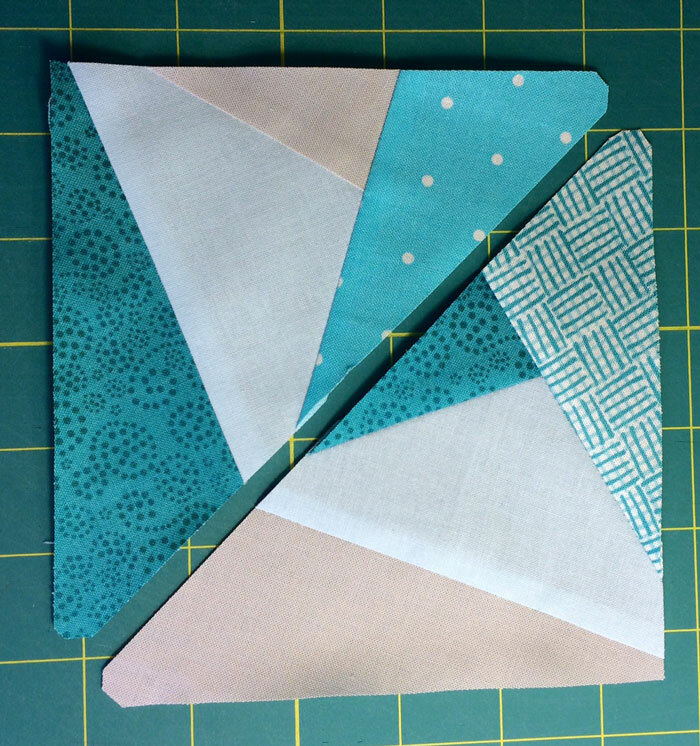 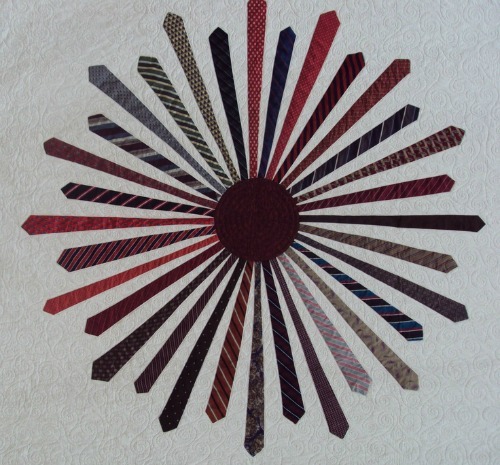 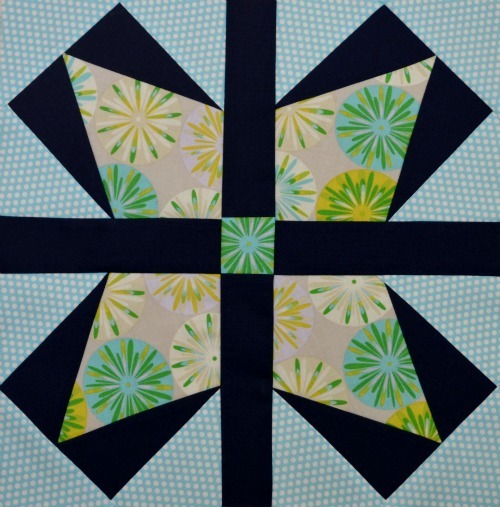 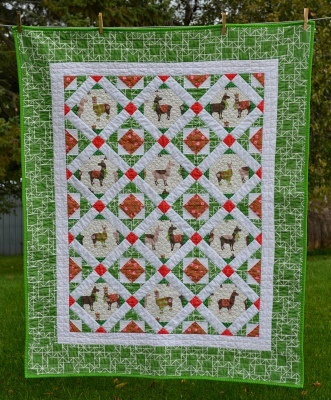 The July block for the Aurifil Designer’s block of the month was designed by Laurie Simpson of the duo Minick and Simpson. 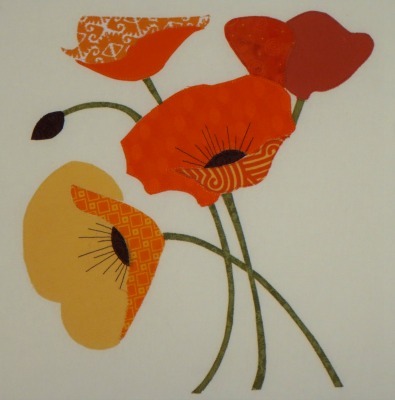 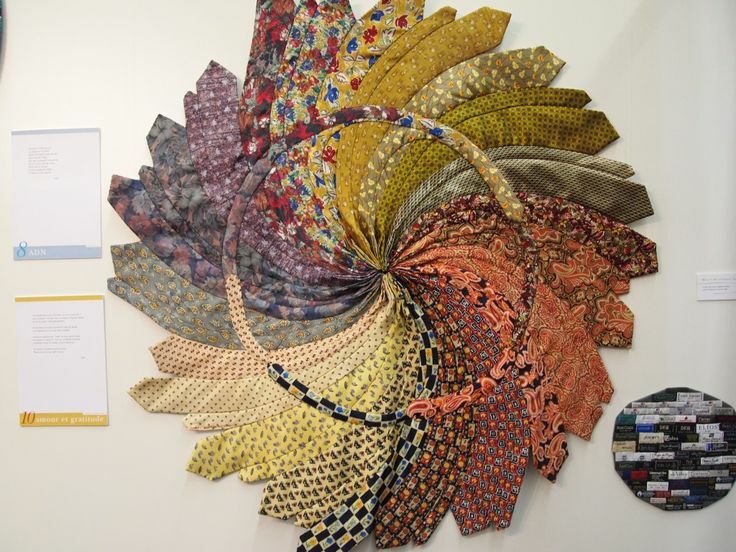 Polly Minick and Laurie Simpson are sisters who design fabrics for Moda. 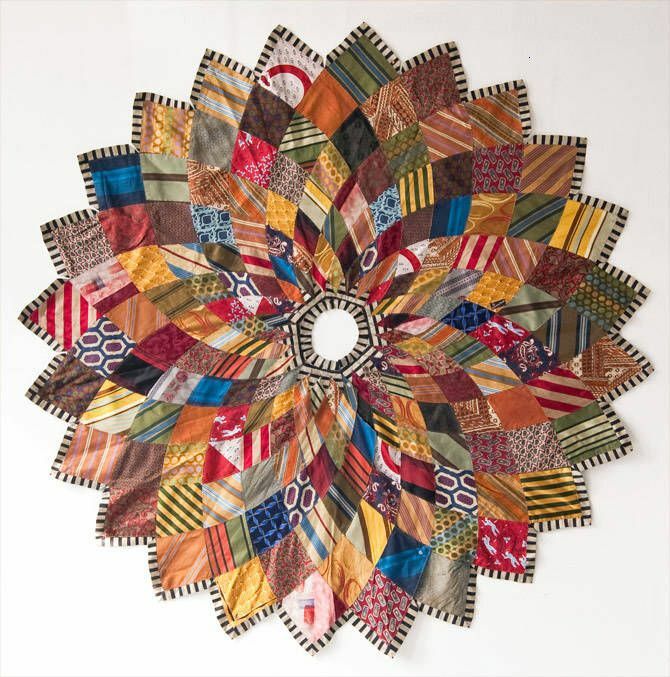 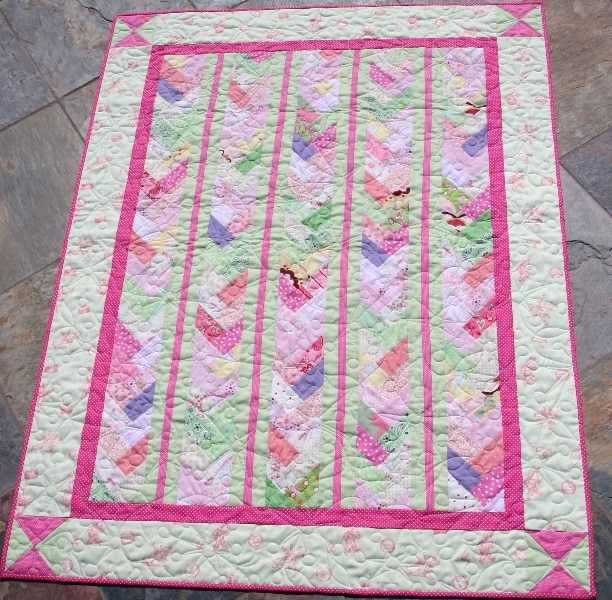 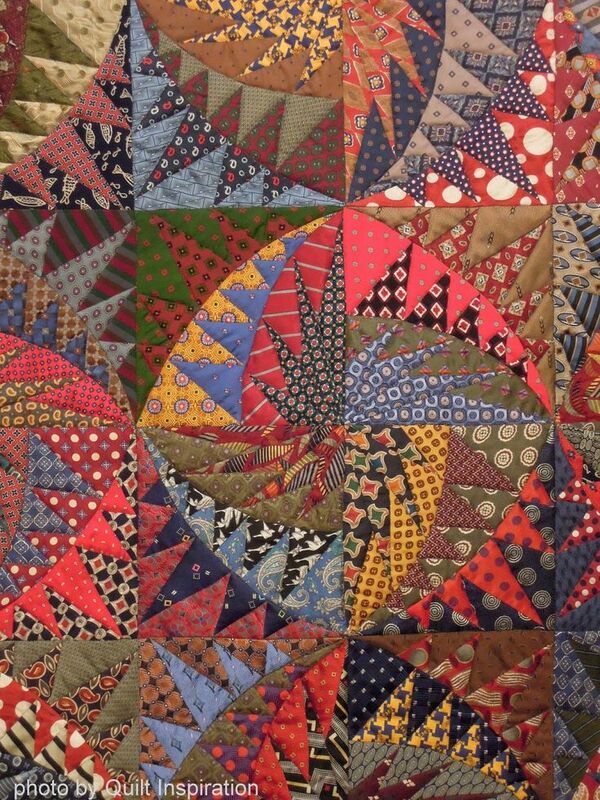 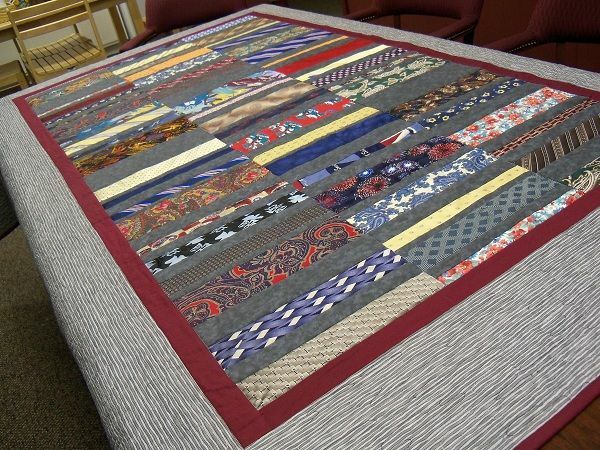 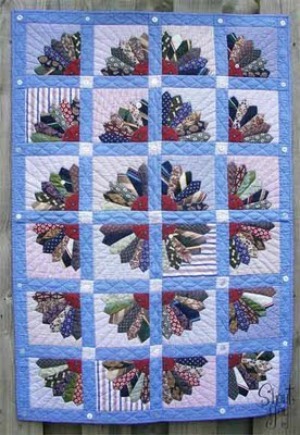 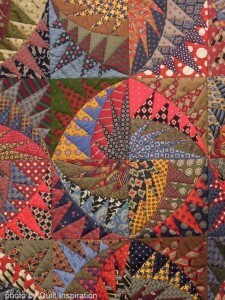 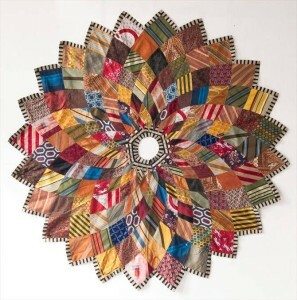 Laurie makes quilts and Polly hooks rugs, so they divide their designing time between cottons and wools. 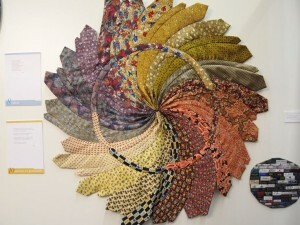 They have recently developed a collection of thread for Aurifil that coordinates with their Moda fabric lines. 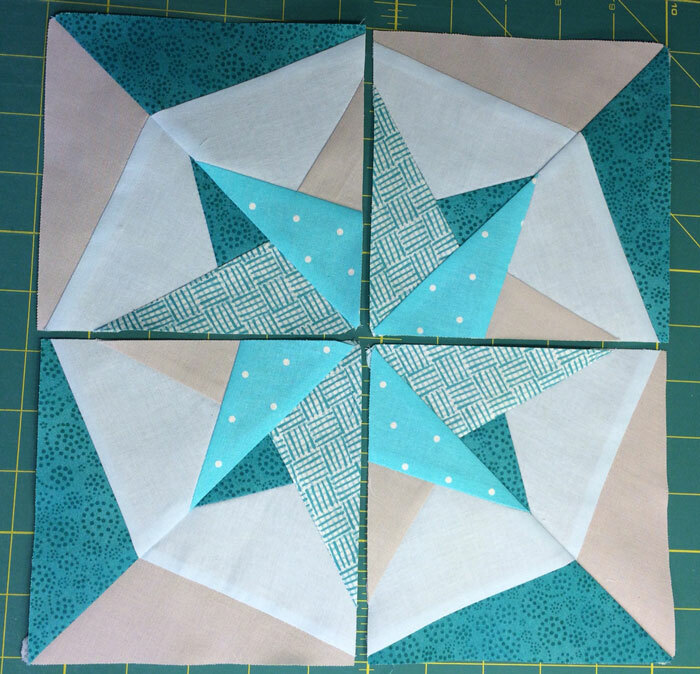 For the instructions for making this block, click here. 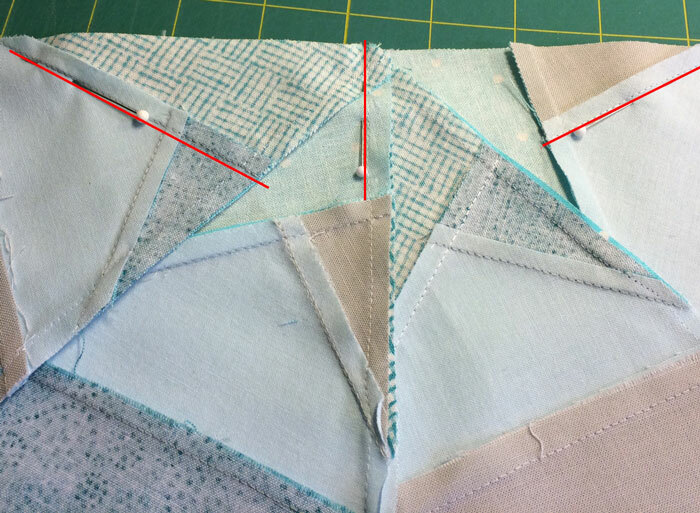 This is a very pretty block, but I have to warn you that almost every seam in it is a Y seam. 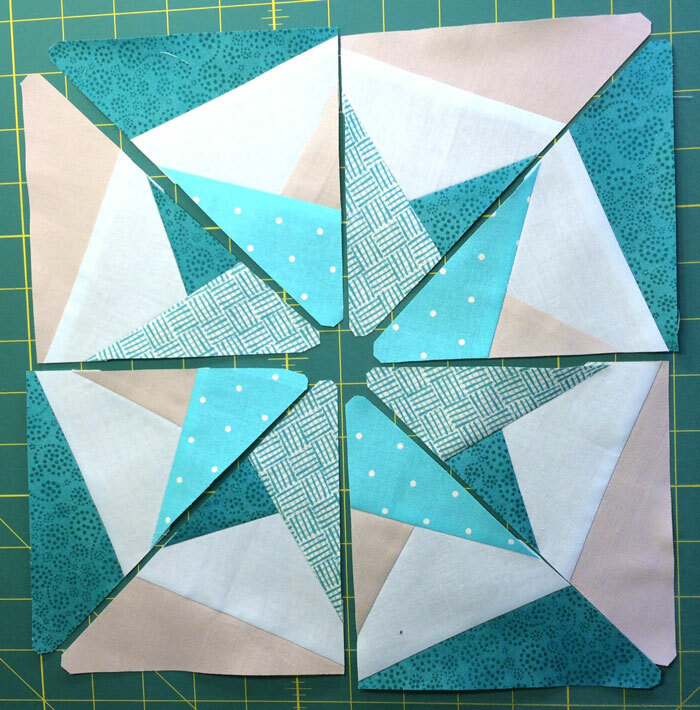 If you don’t have a lot of experience with in-set seams, you might want to hand piece this block. 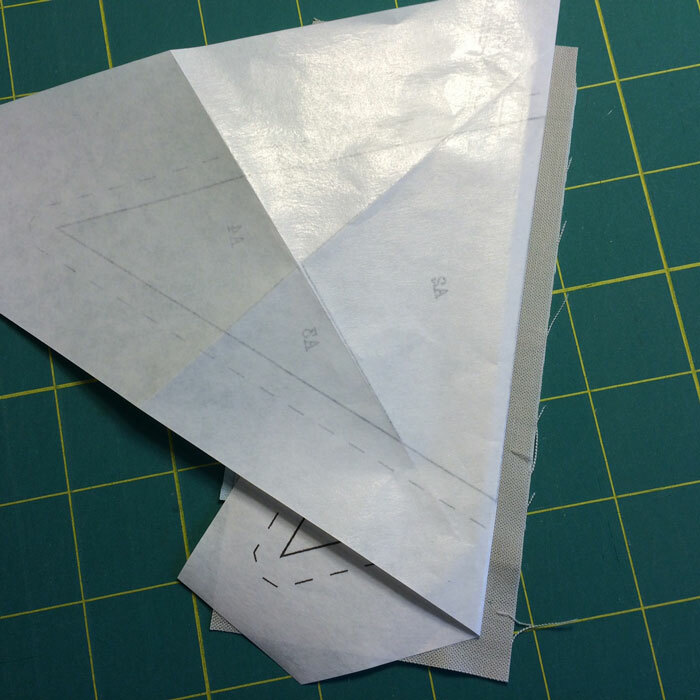 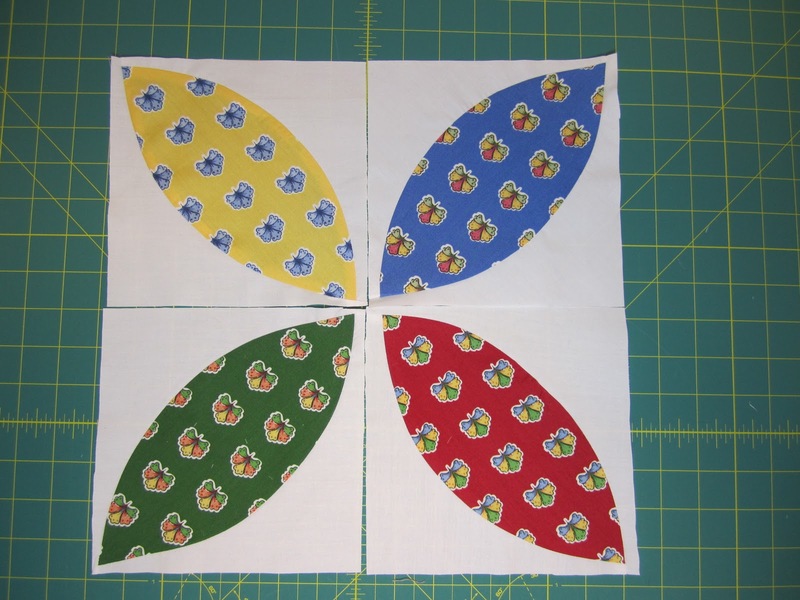 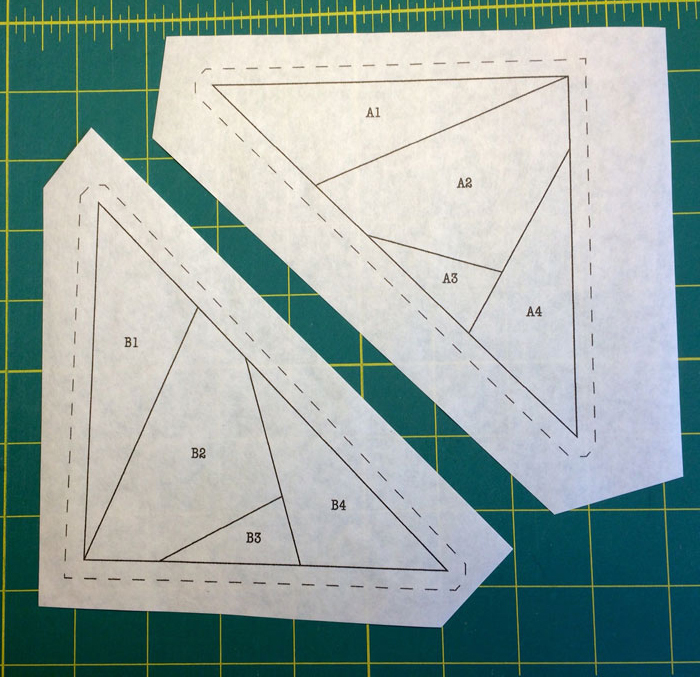 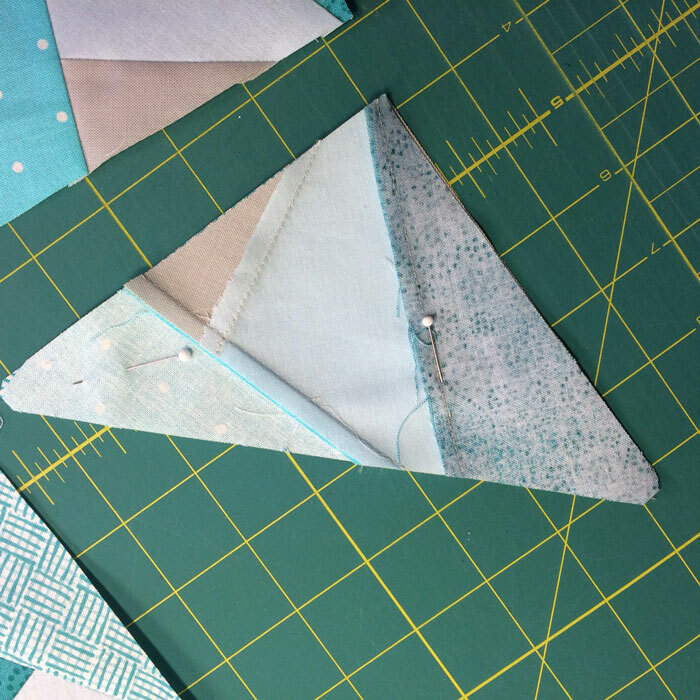 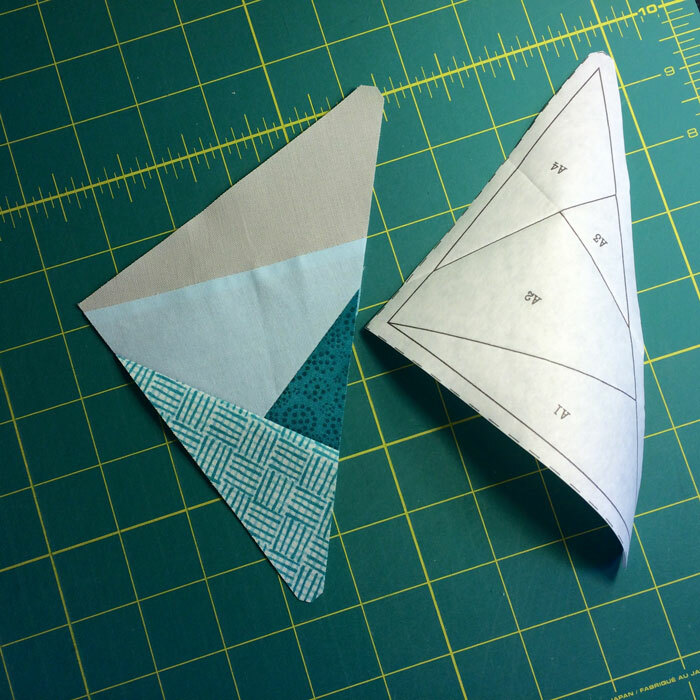 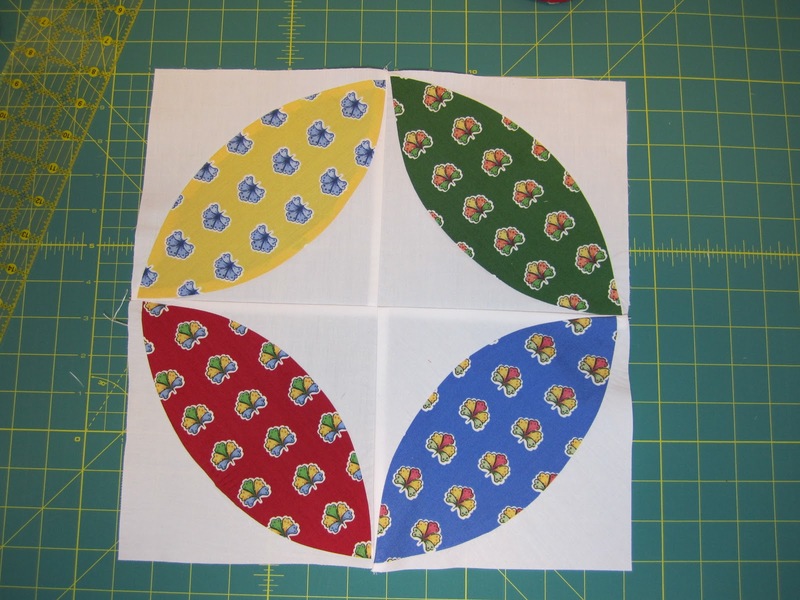 Hand piecing makes it easier to manipulate the patches for sewing. 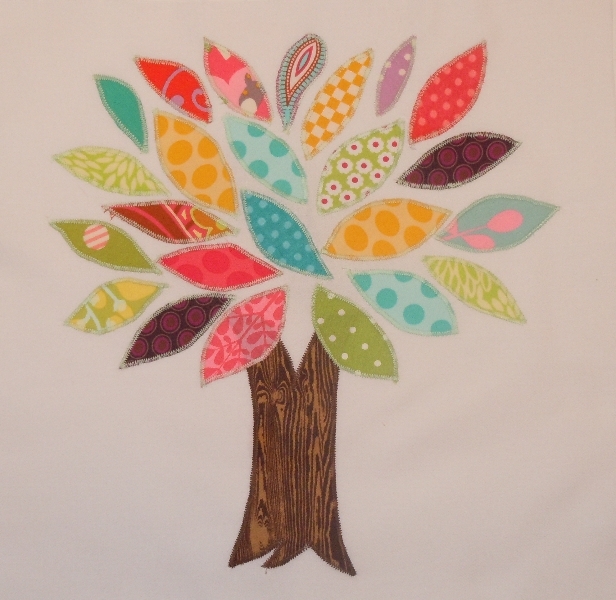 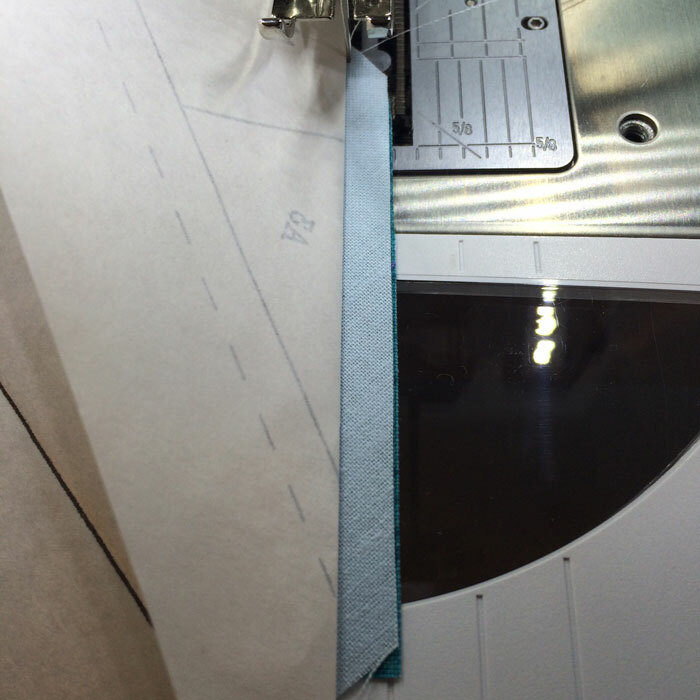 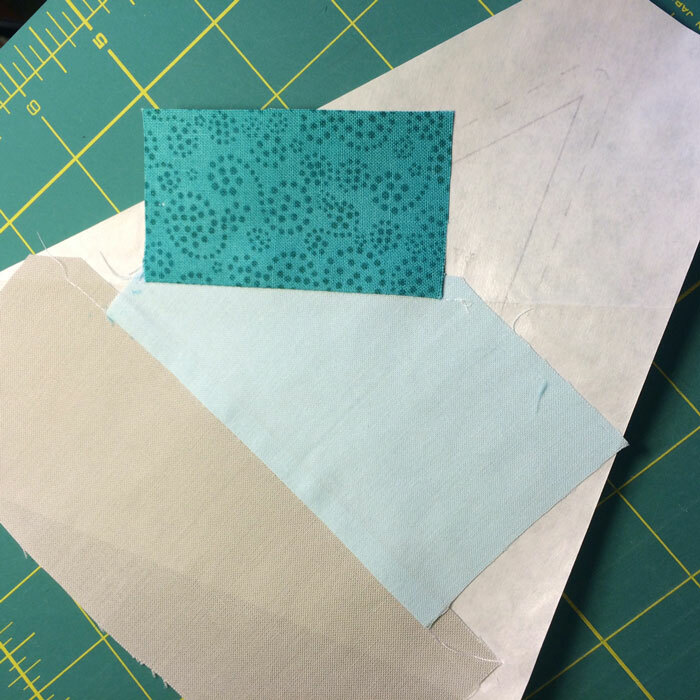 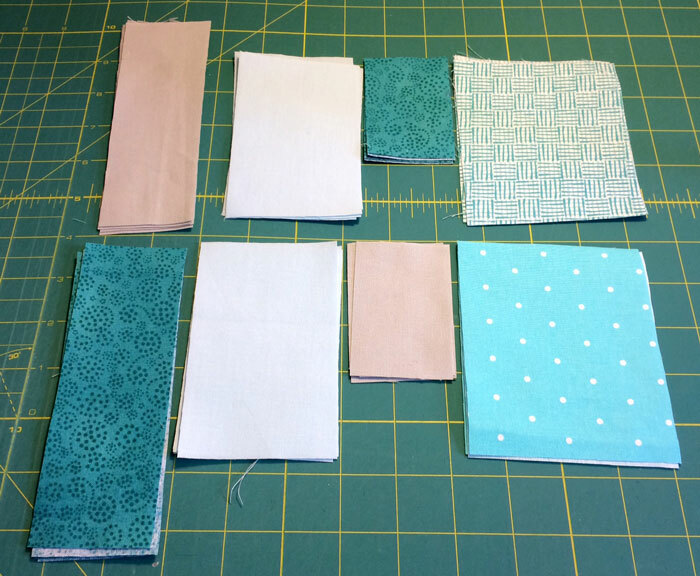 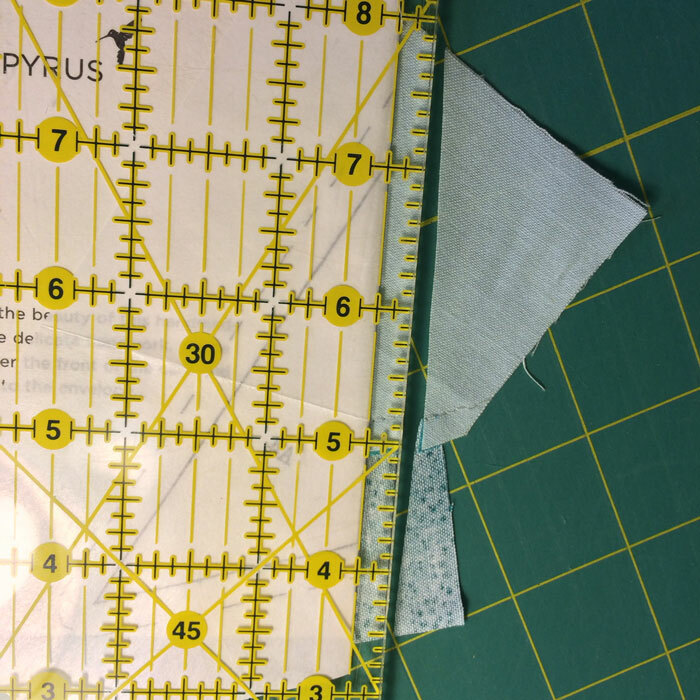 Mark the fabrics with the little dots on the templates, matching them up as you go. 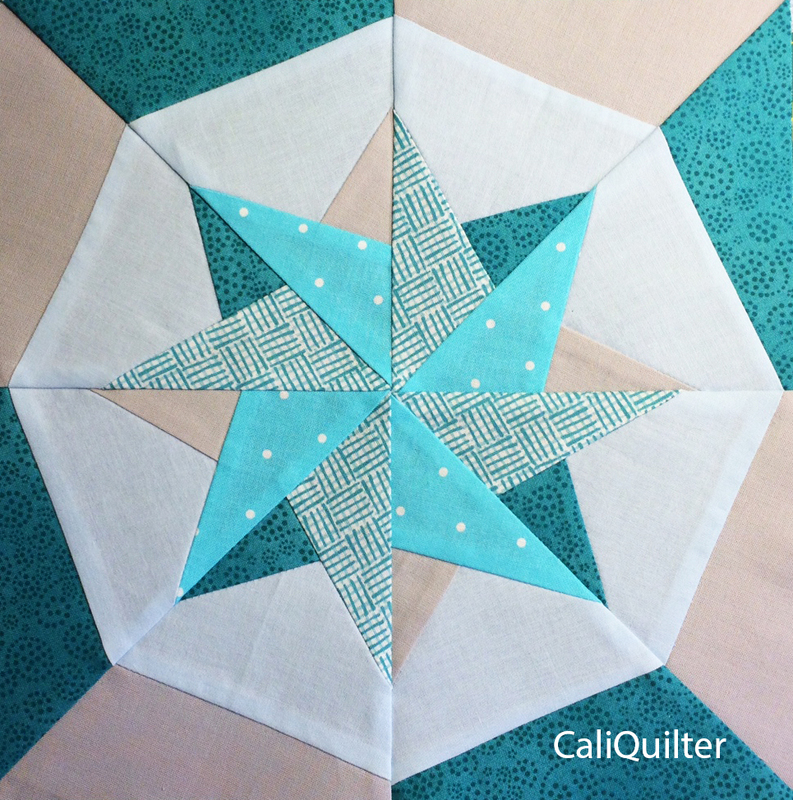 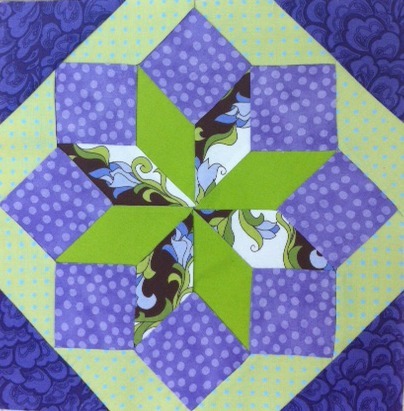 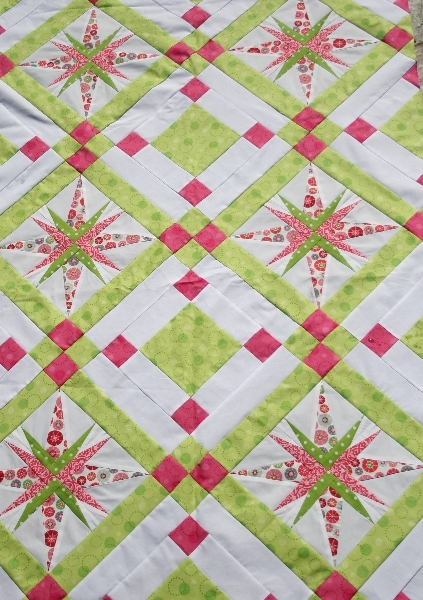 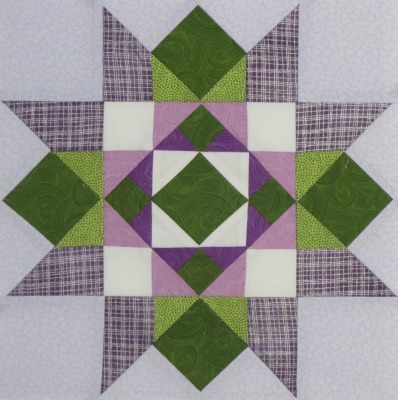 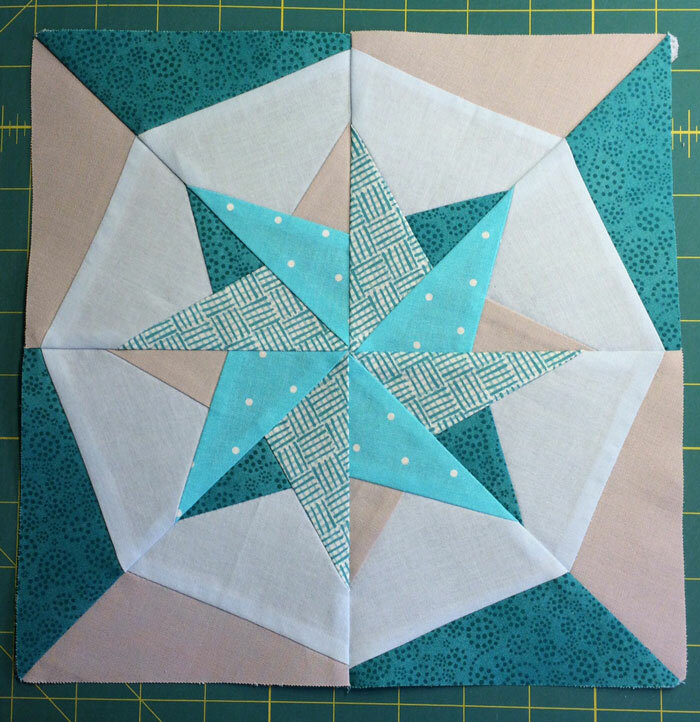 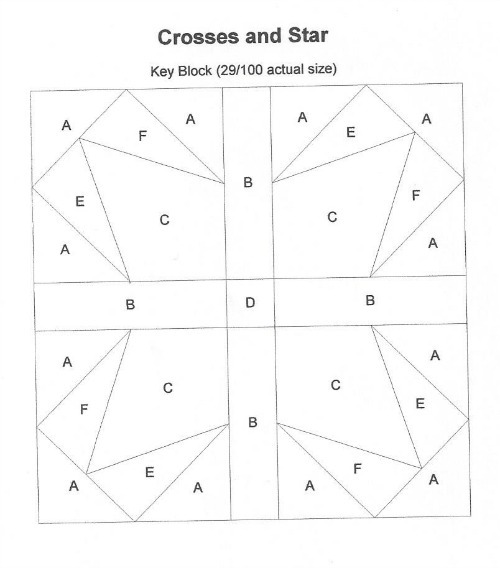 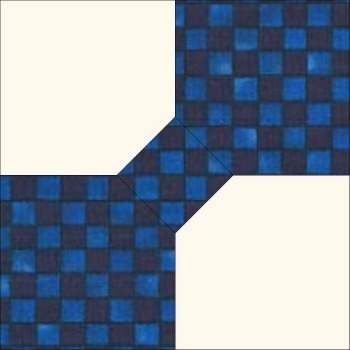 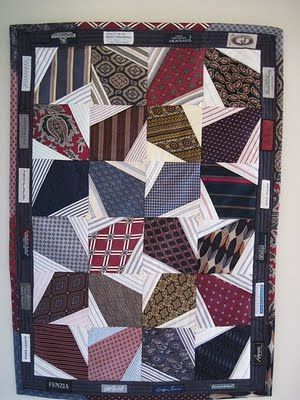 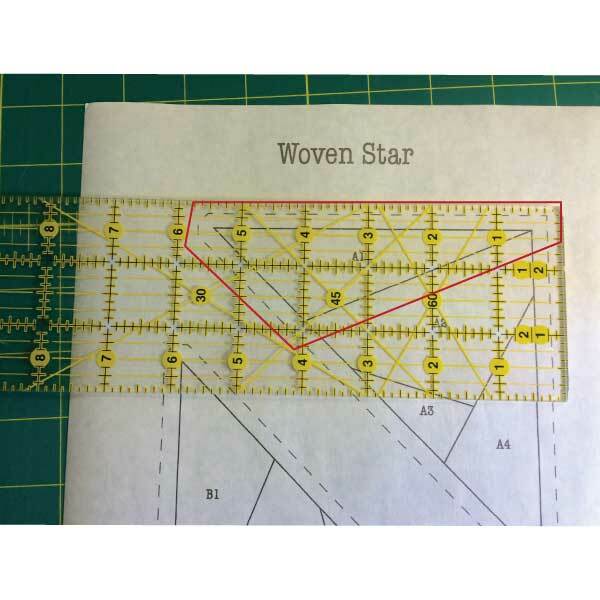 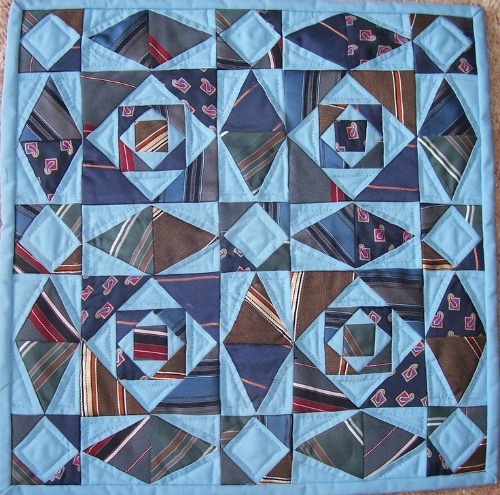 This tutorial is for the block “Crosses and Star”. 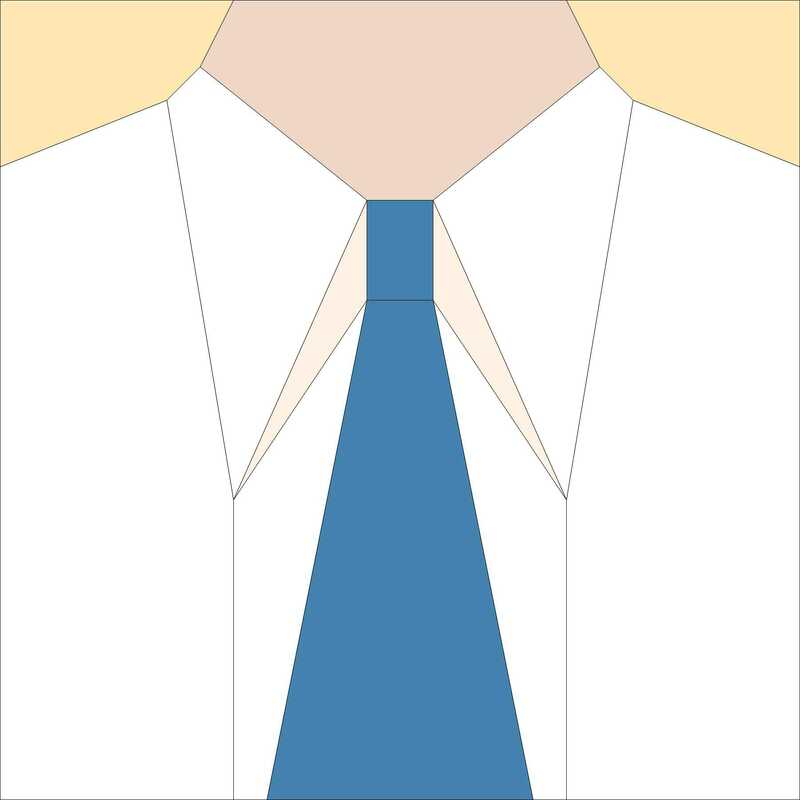 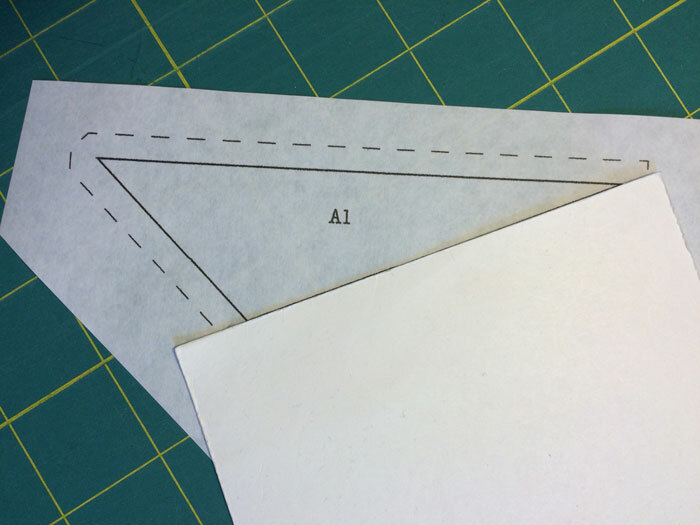 Using this slightly wonky diagram as a guide, begin by sewing one E and one F to each side of C.
Next, sew A to F, and another A to E. Then sew a third A to E-F. Repeat for the remaining three corner units. 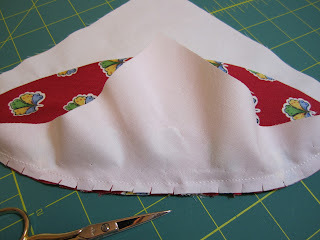 Sew the top two corner units to each side of B. 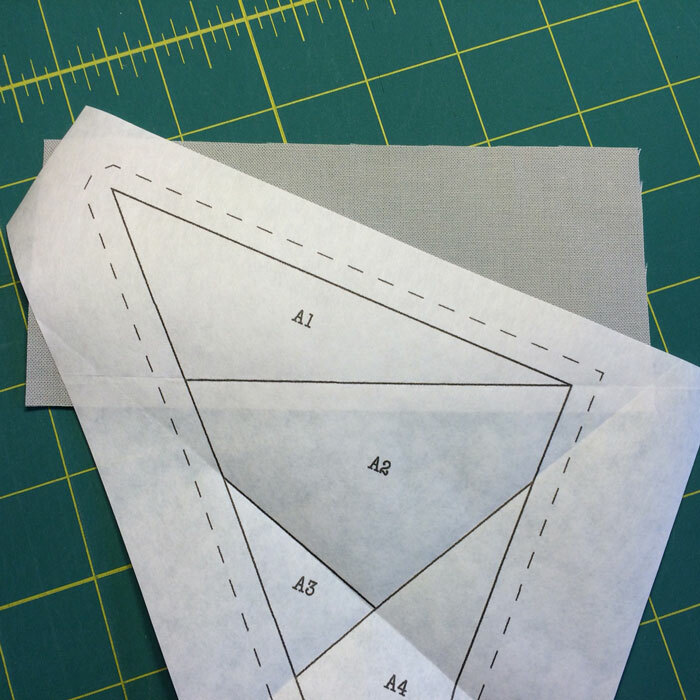 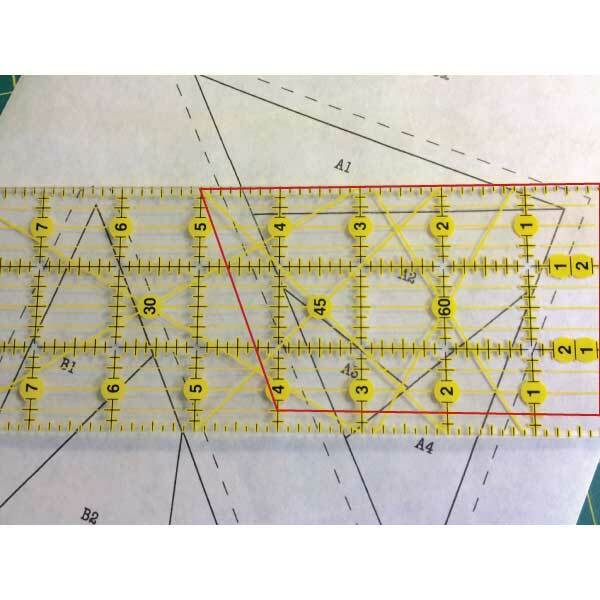 Press toward B.
Sew a B to each side of D. Press toward B.
Sew the bottom two corner units to each side of B. 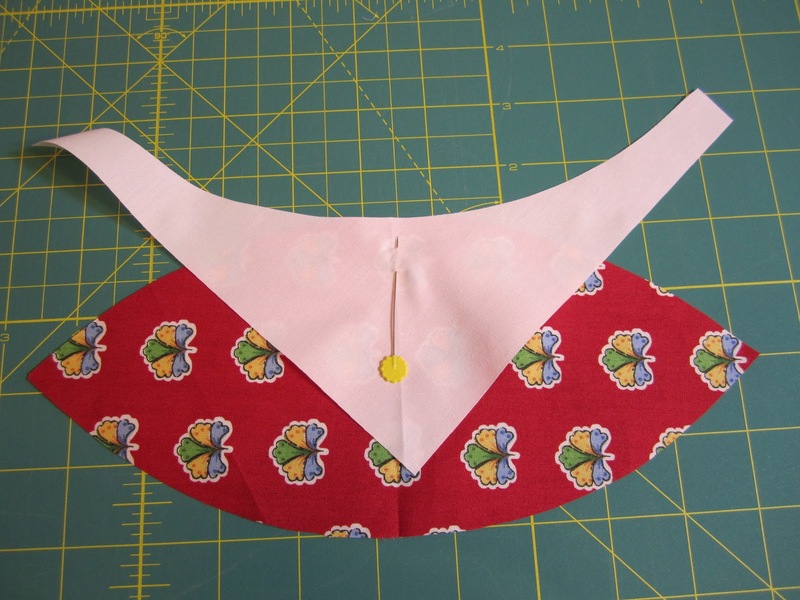 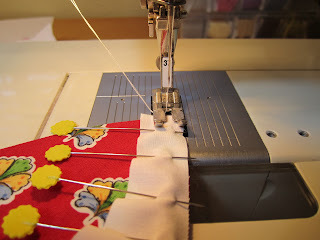 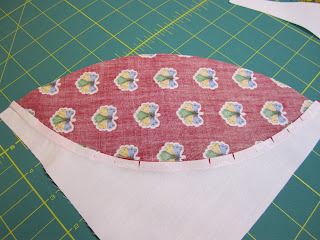 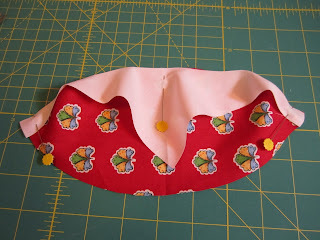 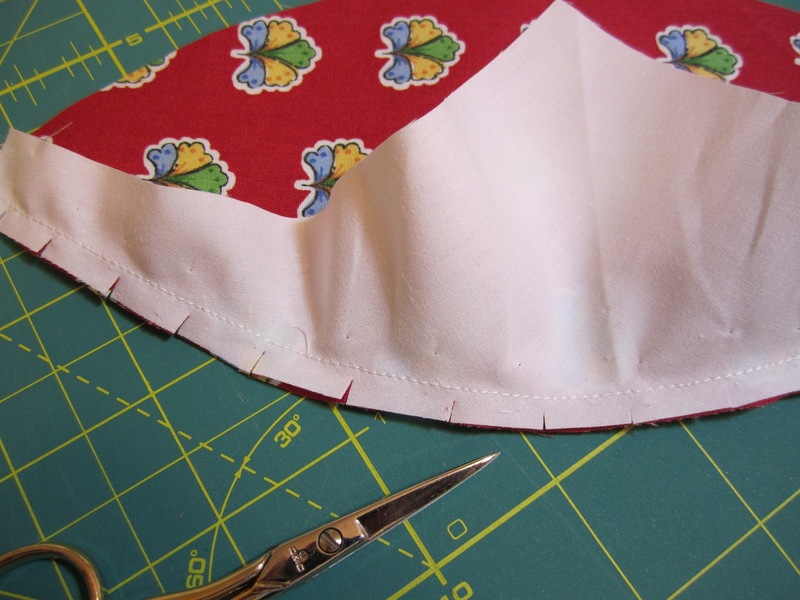 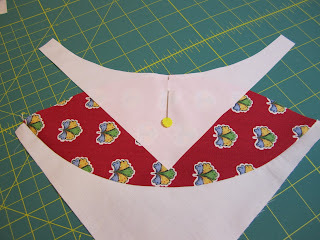 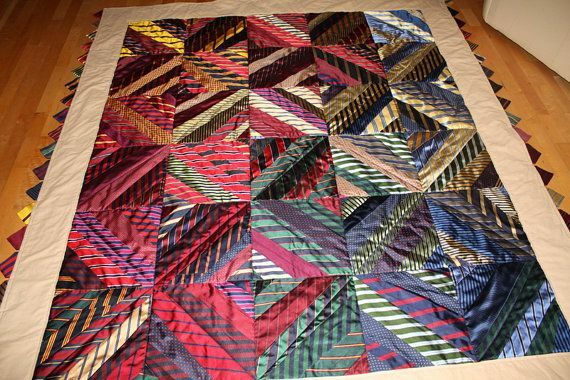 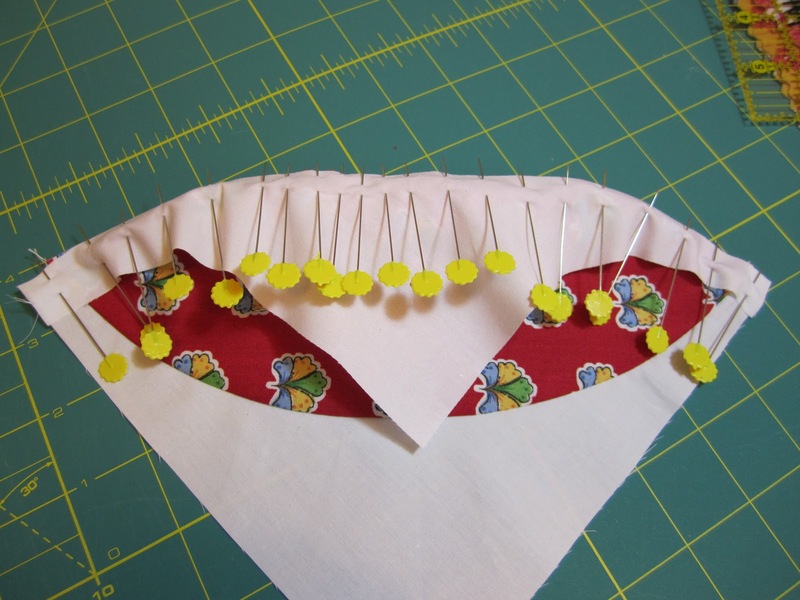 Press toward B.
Sew the top units to B-D-B, and finish by sewing the bottom units to the other side of B-D-B.